*Actress Audra McDonald is no longer a single woman. 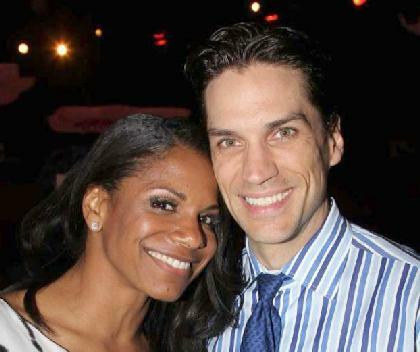 The former “Private Practice” actress married Broadway star Will Swenson at their home in Croton-on-Hudson, New York on Saturday night. According to PEOPLE, the two Broadway vets – who met in 2007 – got engaged this past New Year’s while on vacation in Puerto Rico. Both Broadway veterans, the two met in 2007 and got engaged this past New Year’s while on vacation in Puerto Rico. “Well that was just the best day ever #SadieSadiemarriedlady,” McDonald, 42, Tweeted late Saturday. Gee, if he was black and she was white? Would there be STILL be, congratulations? Answer?…..HAAAAAYiiiiiiiiil naaaaaaaaw! You knoooooow their “vicarious bitterness” keeps them from being objective enough, to be…..fair. Beleeeeeedat!! All Toms and Tomasinas will receive their just reward when the revolution comes. Let each man or woman be paid in full.We ourselves.